Batting: Travis Head 56 off 42 balls, Alex Carey 44 off 40 balls, DJM Short 47* off 52 balls. Bowling: Moeen Ali 4/46 in 8.4 overs, Sam Curran 2/44 in 6 overs, Adil Rashid 1/32 in 8 overs. Batting: Jos Buttler 110* off 122 balls, Adil Rashid 20 off 47 balls, Alex Hales 20 off 29 balls. 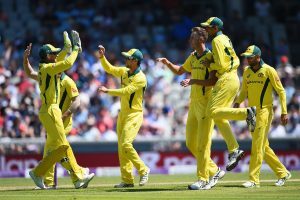 Bowling: Billy Stanlake 3/35 in 10 overs, Kane Richardson 3/51 in 9 overs, Ashton Agar 1/34 in 10 overs. England had a golden chance to make history by clean sweeping Australia. While, the Australians were in need of a consolation win to prevent a humiliating series loss. Sam Curran made his debut for England and English pacer James Anderson presented him with his ODI cap. After winning the toss, Tim Paine chose to bat first as the pitch might offer some spin later on in the match. Finch and Head opened Australia’s innings and Jake Ball was given the new ball by Eoin Morgan. Both openers started off in an aggressive fashion and brought up their 50 runs partnership in 5 overs. This is when Moeen Ali was brought into the attack to break this partnership. And, the bearded spinner struck straightaway as he shattered the stumps of Finch. Stoinis joined Head. But his stay lasted only one ball as his poor execution rewarded Moeen Ali with his 2nd wicket. Shaun Marsh joined Head. Head continued to bat aggressively and scored yet another half-century. Liam Plunkett was induced into the attack. And, the English struck in his 1st over to remove Travis Head who was looking quite dangerous. To add to their troubles, Shaun Marsh also got out in the next over as Moeen Ali claimed his 3rd wicket in 4 overs. At this point, Australia were 4 wickets down for 100 runs. Alex Carey and Tim Paine were present on the crease. 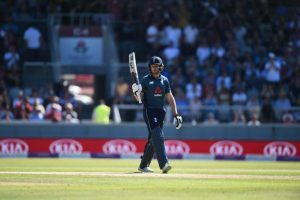 Both had to rebuild Australia’s innings but once again luck favoured England as Time Paine got run out after facing only two balls; courtesy of Jos Buttler’s exquisite fielding. DJM Short joined Carey. The pair batted sensibly and brought up the 2nd 50 runs stand of the innings. This is when Sam Curran was induced into the attack. And for the 3rd time in this match, Eoin Morgan’s tactics bore fruit as the debutante, Curran got his first ODI wicket in the form of Alex Carey. Agar joined Short, but his stay lasted 2 balls as Curran uprooted his stumps with an in-swinging delivery. Australia were now 7 wickets down and had only scored 163 runs so far. Short stayed strong from one end but England began to rip through Australia’s lower order. After, Richardson got run out, Rashid finally got his wicket as claimed the wicket of Lyon by uprooting his stumps. Stanlake joined Short. But after facing two overs of spin, Moeen Ali finished it off for England by claiming the wicket of Stanlake. Australia are all out for 205! Adil Rashid and Moeen Ali finish the series with 24 wickets between them. Moeen Ali getting wickets again. I don’t reckon he’d get many more in park cricket. With England needing 206 runs to complete a historic white wash, Bairstow and Roy opened the innings and Agar started it off for Australia. Tim Paine’s radical move to give Agar the 1st over worked as Roy succumbed to the left arm spinner who shattered his stumps to give Australia an early wicket. Alex Hales joined Bairstow. But, this partnership lasted only 17 runs as Billy Stanlake took the wicket of Bairstow and England were now 2 wickets down. Root joined Hales. But, the Test captain departed in the same over and at this point England had lost 3 wickets for 23 runs. The English captain Eoin Morgan joined Alex Hales. But, Stanlake returned for his 4th over to claim his 3rd wicket and England were now 4 wickets down. With this wicket, England Vs Australia had just become more interesting. Jos Buttler joined Alex Hales. The pair added 23 runs to the total after which Richardson struck to claim the wicket of Alex Hales. England had now lost half their wickets and still required 156 runs to win this match. Moeen Ali joined Jos Buttler. Both shared a valuable partnership after which lunch was called. An exciting finish ahead after the lunch break! Play resumed after lunch as Australia began to tighten their grip by bowling economical overs one after the other. This approach worked for the Australians as Stoinis took the wicket of Moeen Ali, with Australia only needing 4 wickets to win this match. Curran joined Buttler. But, the pair could only add 26 runs to the total after which Richardson struck twice in two balls to get rid of Curran and Plunkett. Adil Rashid joined Buttler with the wicket keeper being England’s last hope to victory. 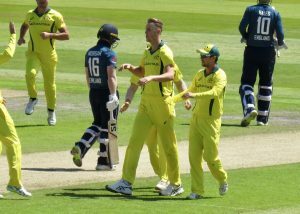 Billy Stanlake was introduced into the attack but it didn’t stop Buttler to reach his half-century and keep England in the race. The pair shared a massive 81 run partnership between them after which, finally Rashid lost his wicket to Stoinis and on the very next ball Jos Buttler reached his century with a six. This is how @josbuttler brought up his 💯!!! With 1 wicket in hand and 11 runs required off 24 balls, Australia Vs England match had now become a thriller. 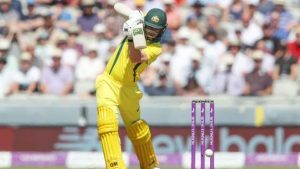 Australia began to assert pressure by bowling economical overs, but Jos Buttler held his composure and steered England to victory with a boundary. Billy Stanlake has wickets 4/27 England in trouble. People bagging Tim Paine this week has been disappointing Tim and Justin Langer have done nothing but great things for Australian Cricket. Jos Buttler is a special batsman and even if he fails in 8-10 games, they should pick him. This is the end of Australia Vs England 5 ODI match series. For more cricketing updates keep visiting allsportspk. Previous articleBreaking World Cup 2018 – Japan Vs Senegal: Japan is the…?